The effectiveness of their response, immediately and throughout the crisis, is dependent upon their ability to communicate with their personnel and other agencies in the area. As we have seen in recent years, hurricanes, earthquakes, even extended heat waves can leave large areas of the country without power, phone service or cellular coverage. In the case of the recent earthquake in the Washington DC area, even though a number of the cell phone facilities remained operational, extraordinarily high demands on these systems rendered these systems virtually useless. Only satellite communications remained un-effected by these events. With a properly designed system and a well-developed contingency plan an organization can remain a viable and valuable resource during the crisis. Satellite systems can be utilized to generate communication using a number of communication options. The options you choose will depend on the nature of the communications and how they integrate into your contingency plans. Connectivity to critical communication points should be established via satellite to satellite links. With a properly designed system, these communications are routed through the satellites and don’t rely on land base systems for the link to be successful. In simple terms a call from one satellite phone to another is not affected by outages on the ground. Many emergency response groups, utilitiy companies, and government agency's are equipped with satellite communication. Build your plan around these connections. By providing your key personnel with a satellite phone or other portable satellite device, they become a part of the critical network. You can utilize satellite communication to effectively communicate outside the affected areas. Direct satellite phone links to headquarters or back-end facilities is one of the primary functions available, but there are other options as well. The message feature available with satellite systems allow you to provide an electronic “bulletin board” that you can use to provide staff, customers and suppliers with situational update. Forwarding traditional phones to your satellite number will create an automatic link to these messages. Connecting with staff and key personnel via text messages and e-mail is another option. Satellite systems can be set up to send text messages or e-mail alerts via satellite. These messages can be directed to other satellite phones, cell phones or computers. One thing we have noticed is that when the cell network in affected areas are operating at reduced capacity or are overloaded, a text message may still get through, presumably due to the minimal band width required. While it is not guaranteed, sending text message alerts out via satellite to cell phones in affected areas my still produce results. Satellite systems can be configured to function as a standalone system completey independent of any existing system. Many organizations choose to link their satellite system into the facility PBX providing the ability to have a satellite phone link throughout the facility. Multiple incoming, outgoing and roll over satellite lines are possible. It is also possible establish data connectivity via satellite. This can range from simple e-mail service to fully functional broadband connections. Your contingency or business continuity plan should already establish who you need to be in communication with immediately and on an ongoing basis. 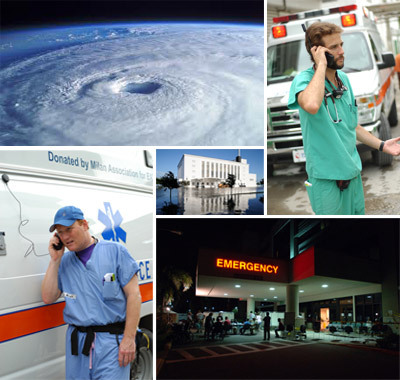 G COMM has worked with many companies in the medical community, emergency response and management, utilities and industry. We have provided Satellite Phones, ComCenters and BGAN broadband terminals to organizations throughout the country. We welcome you to draw on our experience to help you develop the right solution for your organization. Click on this link (1.2 MB) to see how Medstar Health utilized satellite communication to meet their critical communication needs.